Ripped pretty good here from about 2-7 this afternoon impossible to get a measure on the ridge here ball parking 7-8 but not sure. Will have to wait for some official spotter reports. One 10 inch storm total about 15 miles southeast of here. Not gonna jump on that though. Officially 15” at MSP Int’l and still snowing. Makes this storm the 12th biggest here on record. All but over. What a ride. It's another January-type morning here in mid-April. I'm feeling the effects of the wrap around snow bands that are spinning off of the mega April storm. The ULL is spinning just to my east and I picked up 0.7" of powder overnight with a 27F temp and WC of 17F. Some spots in the northern burbs may pick up 1-2". Still snowing here... Have to be close to double digits..
Never-ending snow...it really is unbelievable how long this storm continues to effect all of us on here. Remarkable system. All-time snowiest start to a calendar year after this storm. We’re officially at 70” since Jan 1. Finished with about 18”. Holy s**t balls! Hahaha...who woulda knew this is where you'd be given how this season started. Congrats man! When we finally get out of this pattern, I'm sure cabin fever will be in HIGH gear. I was just gonna say, MKE peeps are getting pounded and I can see the lake is certainly influencing the waves of precip in your area. Any reports near MKE from the overnight/morning snowfall? Not sure. I had a new coating on driveway this morning. I remember in late Dec we were already 16” below normal on the season. Incredible turnaround since then for sure. The 'flip of the switch" is an under statement for what has happened in your world. 2018 is turning out to be quite an interesting start for those members in the north. How will we finish this calendar year is the million dollar question? My feeling is that next season is going to be just as wild, if not more severe, from what I'm analyzing and studying at the moment. 8-12" more for the Straights region and NEMI. That's just nuts, even by their stds! We can officially call this storm a “dome buster”. I think you asked on Saturday when the last time MSP was under a blizzard warning. It was on April 14, 1983. Yeah, surprised me as well. That’s crazy. 35 years to the day. I didn’t know the weather service was THAT stingy with the blizzard designation. The wind criteria is a tough one to reach in the core of the metro. Enjoyed a snow day today. I'll remind you that the foot from a week ago was gone. This is all new snow. I think that this was the 2nd 20"+ storm in my 40 year lifetime. This storm had it all. Duration, winds,thunderstorms, etc. Over 30" in April. Absolutely incredible. Here's a photo from Menominee, MI...just north of GRB in the U.P., and on the western shores of Green Bay. They received over 2' of snow and that was a record for any calendar month. 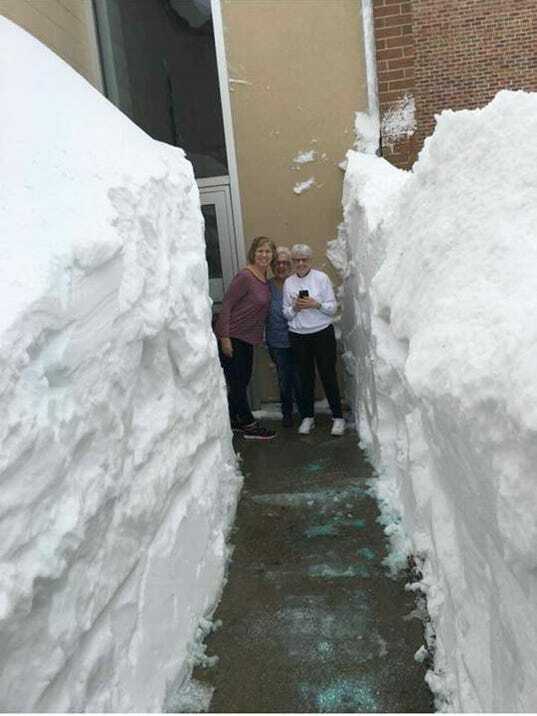 Snow drifts were as high as 10 feet! Now that is a tunnel. 3.43" estimated liquid between the rain, sleet, snow. Hoping for a gradual melt. When I saw their total I knew it must've been way up on the list. That locale is NOT snowy at all. Fantastic storm. Like the legendary ones you normally only read about. The Big Mack was closed to everything but passenger cars with gusts over 50 mph and this little quiz asked peeps if they'd wish to cross in those conditions. I joined the "chicken" crowd-no way! Scary enough 200 foot up in the air when it's dead calm. Heck, even a small breeze which is kinda typical in the Straights sways the bridge like 10 feet left or right. The Big Mack was closed to everything but passenger cars with gusts over 50 mph and this little quiz asked peeps if they'd wish to cross in those conditions. I joined the "chicken" crowd-no way! Scary enough 200 foot up in the air when it's dead calm. Heck, even a small breeze which is kinda typical in the Straights sways the bridge like 10 feet left or right. Just takes that one rogue gusts and you're a YUGOne! !